Being a manager or a project leader is a juggling act to perform. Amidst all the project demands, deadlines, and revisions that need to be completed to satisfy clients and customers, managers need to make sure that the challenges and successes of team members are being recognized as well. You may also see sample activity reports. With that being said, having a weekly status report to monitor productivity and progress is an essential tool that businesses and organizations must invest on. Given the amount of time and work involved in such process, it pays to consider whether you’re making the most out of the whole process. A weekly status report is a potent management tool that represents how an employee has invested his or her time at work in the course of the last five to six working days. 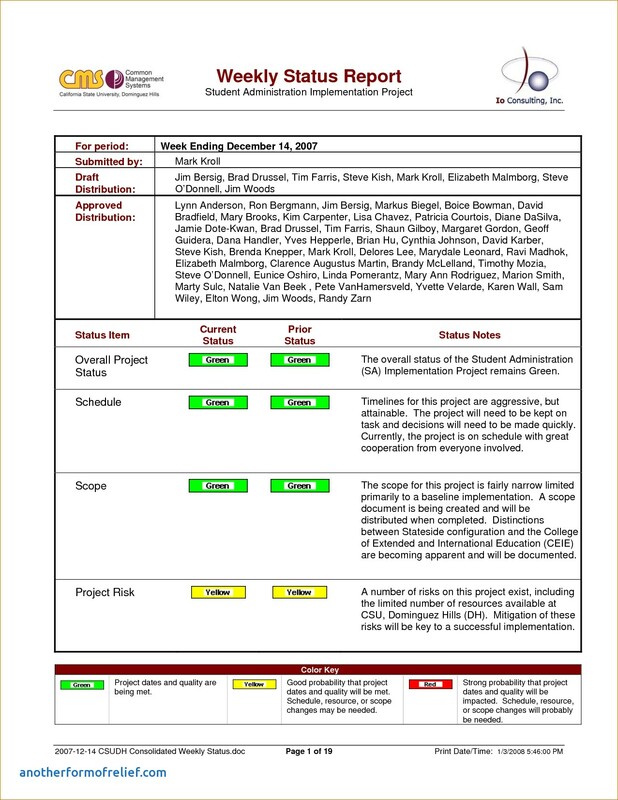 The written report serves as an efficient way to communicate and monitor all projects, tasks, and progresses during the week for clients and managers to refer to. Report writing might seem quite heavy to your already busy schedule, but it’s something to consider in order to obtain success. But this is more than just a system that managers and team leaders can benefit from, as it also gives employees a chance to demonstrate their skills and abilities to the higher management. Normally, managers do not have enough time in the day to speak with every single employee about their weekly tasks in complete detail. Time constraints make it difficult for managers to track the progress and performance of their members within a given time period. As leaders of the group, it’s important to stay on top of the most important things that involve each member of the team. This is where a weekly report comes in. You may also see examples of short report. Though conducting a one-on-one discussion with your employees is a crucial task to consider, it can’t always be done effectively due to a number of factors that can take up most of your time. Fortunately, having a written summary of the things that your employees consider as important can be a valuable record to keep. Down the road, you can use the record to present your team’s achievements for the quarter. A status report can also be used as a reference for the senior management regarding information on what has been discussed during a meeting, as well as the activities performed to complete a project. Instead of delivering bulks of information at a time, you can make use of a weekly report to break down this data into more manageable and comprehensive parts. This also gives you the opportunity to provide feedback to your team in order to correct mistakes and encourage growth. As a member of the team, a simple report can help you identify the key aspects of your duties. 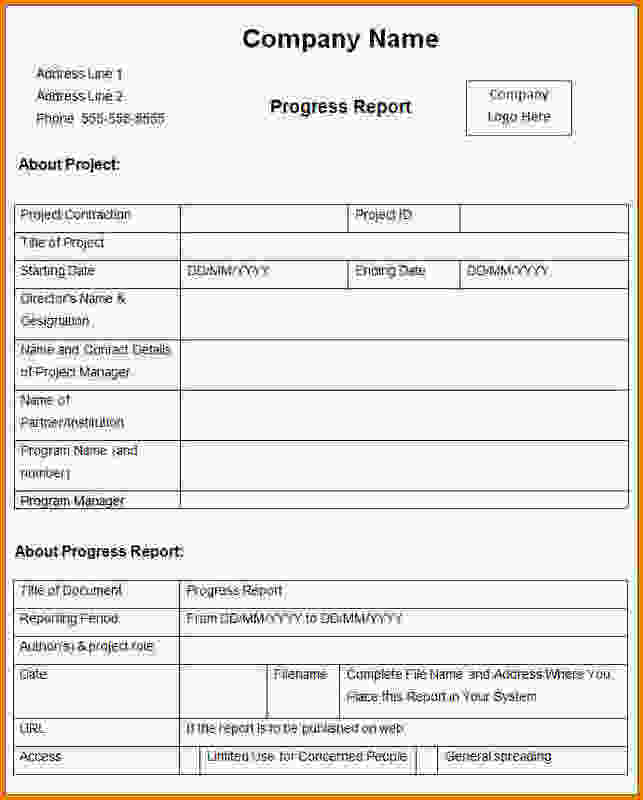 The report allows you to relay details directly to the respective manager regarding the achievements and issues encountered during the process of completing a task. Perhaps you need some support on certain assignments that you’re struggling with. If the manager notices any problems that might put a strain in the project, then you may be provided with some assistance to avoid potential delays. Additionally, having a record of accomplishments and responsibilities over the past months or even years can be valuable information to keep to support a possible promotion or new job opportunity. The record of reports shows the amount of progress made over the past days and weeks to determine the factors that may have been affecting your performance either in a positive or negative way. You may also see business report examples. Through the feedback provided by your leader, you can identify which aspects of your work ethics or projects may be improved on to obtain a better performance. A lot of people make the mistake of firing their shots but forgetting to see where their aims have landed. In business, you can’t expect your company to succeed if you focus so much on increasing sales without considering a return in profits. Similarly, when writing a weekly status report, you need to see where your information flows, along with what it brings as it makes its way back. You may also see investigation report samples and examples. There are two types of report writers: those who exert the absolute minimum effort required into the composition and those who document every single detail of their day in order to justify their existence. Unfortunately, neither practices are useful. Limited information could lead to the absence of significant data, while lengthy reports tend to lose track of the main purpose and objective of the said record. You may also like service report examples. To maintain consistency across the workforce, providing a simple structure with the help of a few direct questions would be your best option. Questions like, “What are your top three achievements for the week,” or, “What challenges have you encountered so far?” can lead to concise and valuable responses for you to work with. 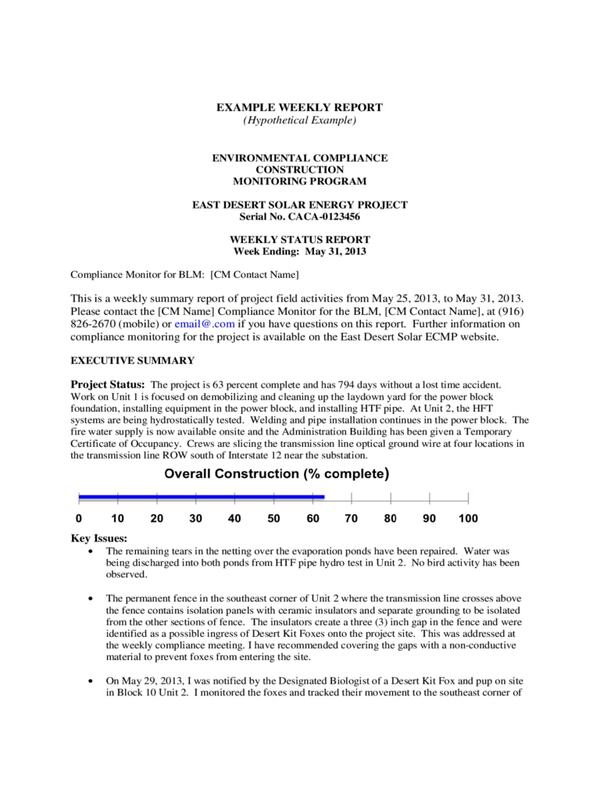 You may also check out project report examples & samples. Offering timely feedback and asking or responding to questions is an excellent way to make your team members know that their input is well received and valued by the management. If employees continue to produce these reports without generating some sort of a reply, then they might assume that their thoughts are simply being ignored. Naturally, this will cause them to give less thought to what they choose to report. Thus, it’s important to provide feedback that is both specific and constructive. This will help the individual learn from past mistakes and develop their skills in fields that they have initially struggled with. Keep in mind that feedback is fairly different from a simple comment. “Excellent report, thank you,” seems a bit dull and useless. Instead, you must be fair and honest with your feedback if you wish to help your members succeed in their fields. You might be interested in management report examples. There’s an invisible barrier that separates managers from members of their team. Oftentimes, this hinders employees from openly expressing their thoughts to their superiors. Fortunately, through the help of a basic report, employees can develop this connection with their team heads in order to initiate a discussion on accomplishments and challenges that impact their performance. But for this to work, a give-and-take model must be observed. People are bound to face challenges along the way. So when you ask someone to share the hurdles that they have experienced in an assignment, the least you can do is address or at least acknowledge their thoughts. Provide information to guide employees who are currently stumbling around their duties. You may also see marketing report examples. Give credit where it is due. Do everything in your power that will encourage employees to continue striving to their greatest capacity in order to achieve something remarkable. Writing a weekly report is a crucial task that demands a little bit of your time and effort to commit to. There are a couple of things that must be emphasized in the report for it to be considered valuable. To develop a short report, you need to be aware of what your manager is likely to expect from your output. For instance, perhaps your manager might want an update on the current feature of the project that you’ve been having trouble with during the previous week. 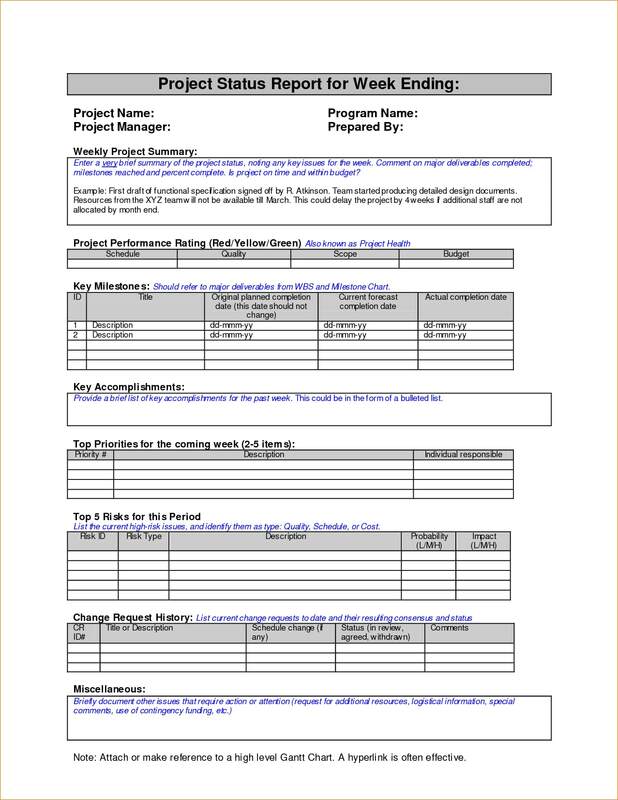 Be sure to note down significant aspects of the assignment that your project leader might be interested in. If you aren’t quite sure about what details to include in the report, then you can always ask your manager directly. This ensures that the content of the report stays timely and relevant to the current circumstances at hand. 2. Pay attention to outcomes. Since one of the primary aims of writing a weekly report is to deliver vital information in a brief yet precise manner, you might want to focus more on the actual results of the assignment rather than the activities performed to accomplish it. Unless needed, skip through points that might not be important to your readers. You should avoid making a list of tasks in complete detail that may not be understood by others. You may also see quality report examples. 3. Take note of key elements in the report. 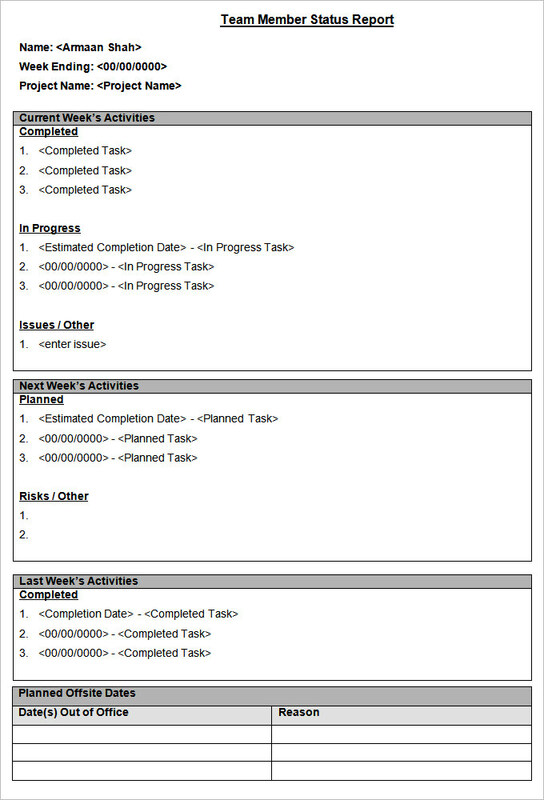 The format of a weekly status report may vary depending on company standards. Generally, it is composed of a brief list of tasks that have been executed, their respective results, major accomplishments, and issues and challenges involved in the project’s success. 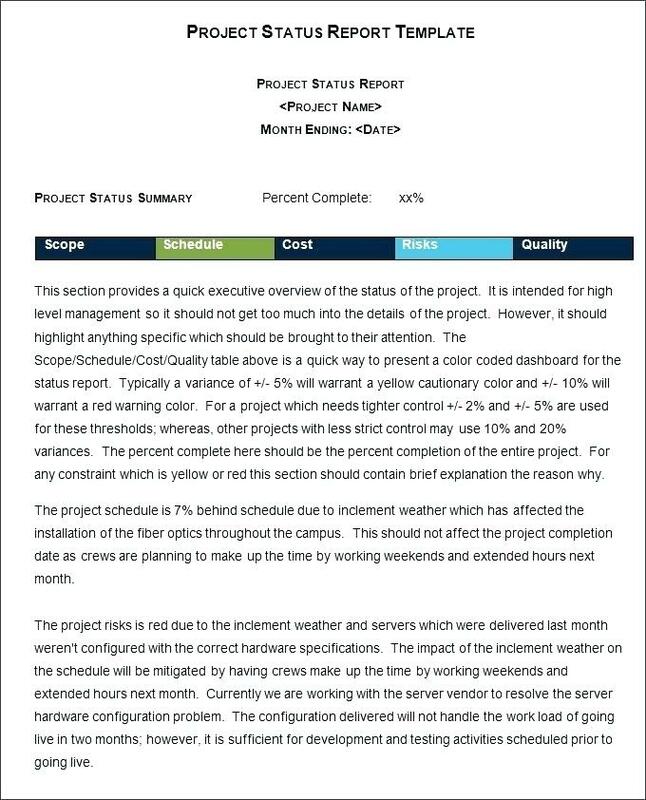 The status report may also include a summary of details related to the time schedule (via Gantt chart), budget, deliverables, scopes, risks, and resources. Make sure to keep it as accurate as possible to avoid any inconsistencies with these reports. 4. Make use of visuals. Although this may not be necessary in some weekly status reports, the use of graphs and charts can work effectively as opposed to mere text. This should only be applied when the report cannot be expressed clearly enough through words. Say for example, a bar chat may be used to present the progress made for a project’s completion. If an individual has failed to finish a task within the week, then they may use the bar chart to show how far along they’ve reached. But be careful though. Some charts can be difficult to translate or read due to the way it is structured. If you aren’t familiar with how a specific chart type functions, then it might be best to go along with the simpler options or to stick with basic text instead. 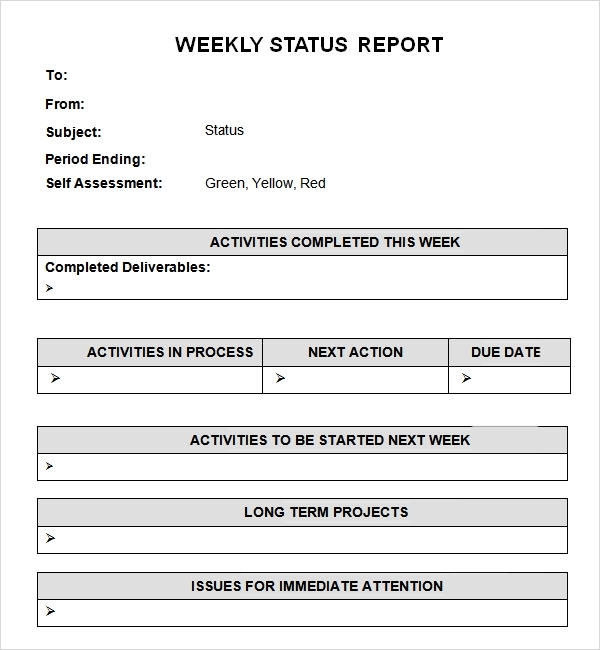 A weekly status report is an effective management tool for a business to have. 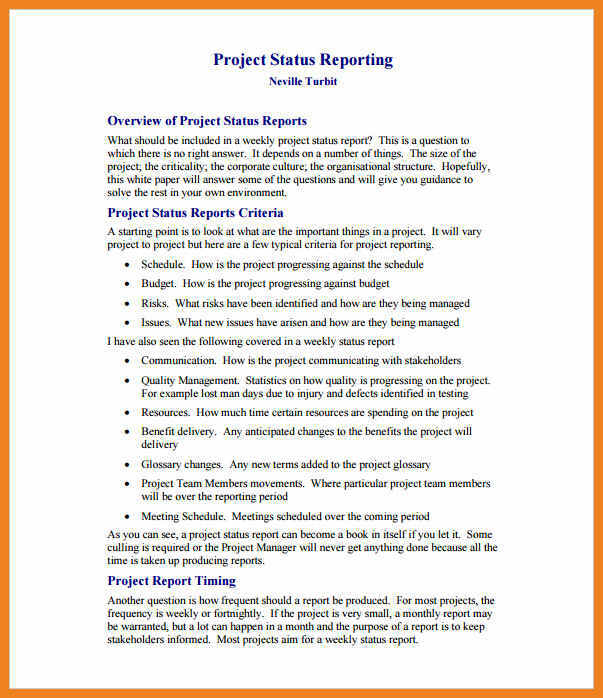 Managers and members of their team can use the report to discuss important matters of a project that must be attended to. This improves internal status communication to ensure that everyone involved in the project is on the same page, and highlights issues that need to be resolved as soon as possible. You may also see formal report examples & samples. 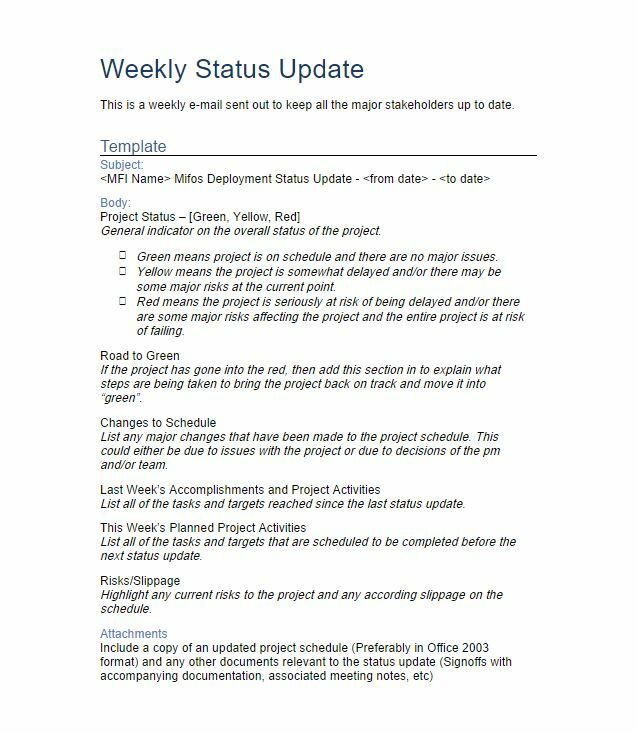 While it may seem a bit over the top to be consistent with these weekly reports, as the project progresses, you’ll come to realize that these ongoing summaries can help prevent unwelcome surprises that could take a toll in the project’s development.